Things are tightening up in the Gentleman’s Game Cup Series. We now have a three-way tie at the bottom rung of the ladder, with our own t3bird04, JSquad34, and Diamondhoggers all locked up; nothing decided after nearly five months of baseball. Things also got a little more interesting at the top with Swindaman3 earning two points last night, and DStars45 earning one. Overall, the gentleman’s game last night was a low-scoring affair with only one contestant reaching the 100 or greater mark. A three run total game in Coors Field certainly didn’t help those gents who went looking for their offense in Colorado. All five gents went with Jacob DeGrom against the Marlins – seemed like an easy call, right? Think again. 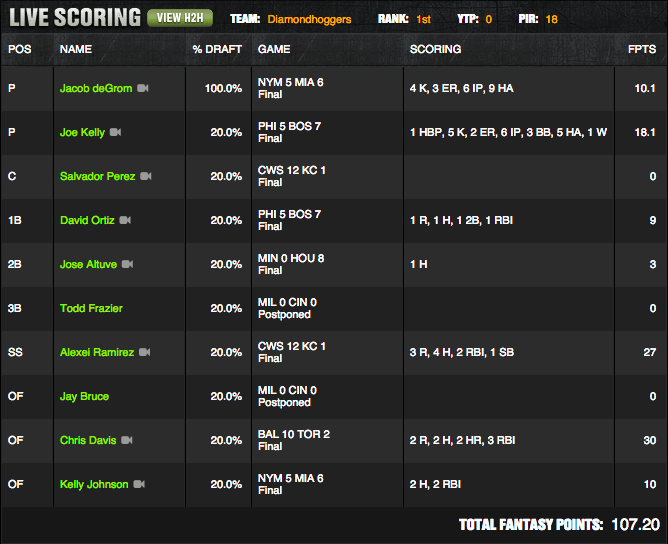 This is DFS baseball, and nothing makes sense. DeGrom earned a little bit less than a point per $1,000 he cost to use in your lineup last night, totaling a paltry 10.1 in Miami. Here are a look at the up to date standings for the year. The moves that really had Diamondhoggers out in front last night – despite losing Jay Bruce and Todd Frazier (who probably would have combined for like three points anyway) – were using red hot Chris Davis who is clearly back on adderall and Alexei Ramirez who luck-boxed his way to four hits and 27 points. Diamondhoggers also used Joe Kelly who was pedestrian as usual but got 18 points and the win for the Red Sox. Here is a copy of the picks to click that worked last night. So what will happen next week, or next time we decide to gather at the cyber bar for this gents affair? This battle of statistical Goliaths. It is possible that we have just three contests remaining. The math is still there for anyone to win this, but those gents at the bottom of the standings will need outside help and a major collapse from DStars45 and Swindaman3 that is very unlikely. 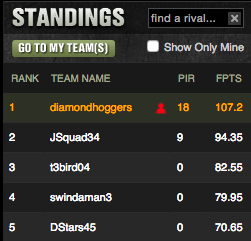 Also, it’s impossible to be consistent at DFS baseball really, so you have to factor that in. In this organized chaos, two gents have stood alone as the best gents for the job. The goal for the other three simply remains to stay out of the basement and play for pride until next spring rolls around. They’re ready for the Gentleman’s NFL cup (which starts next weekend). Next Story → Was the Inaugural Gentleman’s Cup Decided Friday Evening?